“Brad Dohack, the consummate professional whose patience helped us find the perfect home! This was no small task as the buying process commenced in April 2017, spanned many many houses that were viewed and eventually closed on September 26. Although Hurricane Irma delayed the first closing, Brad was able to keep the builder engaged and our confidence high so that we could close on 9/26. 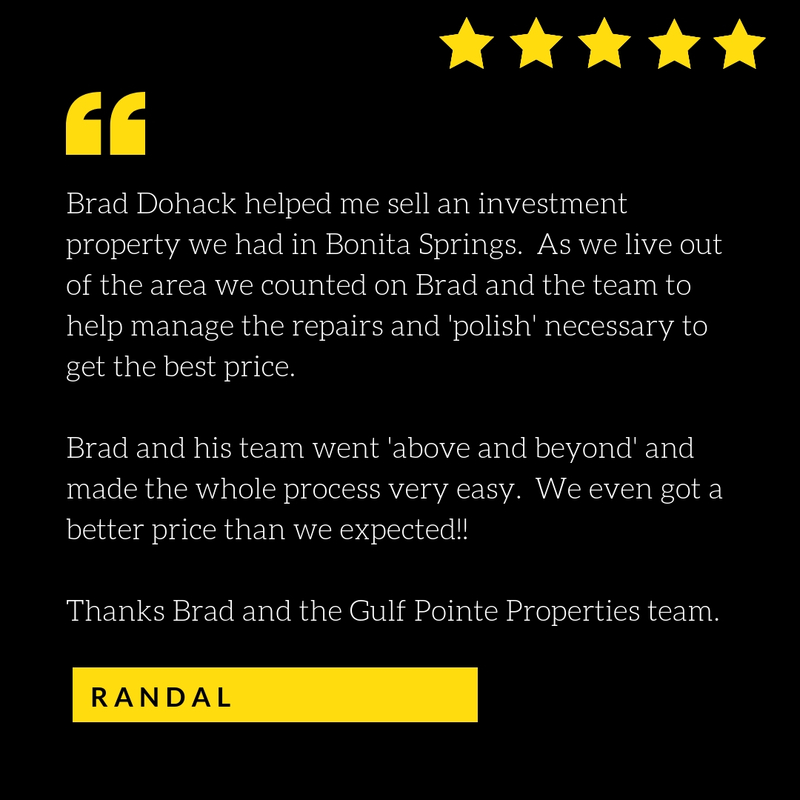 “My husband and I had the pleasure of working with Brad Dohack from Gulf Pointe Properties. We live in southwestern Pa. and recently purchased a second home in Florida. There would not be enough space in this memo to say how helpful Brad was. But I will say this we are the parents of five sons and have been around a lot of fine young gentlemen in our life time. So we easily can see how Brad’s parents can smile and say we are so proud of our son. We Wholeheartedly Endorse Brad and Team! “Brad took our listing on knowing we only had about 30 days to sell our home cause we were already 90 days in with a different realtor and also locked into buying new construction. The only thing he promised us was he would work his hardest to get our house sold in the time frame we had. He did this also knowing we had to get a certain price for the home. Needless to say, we had over a dozen showings in the first week and a written agreed to contract in just 12 DAYS! Throughout the process, Brad was easy to get a hold of, kept us informed at every turn of the transaction, and was very professional. He was everything we could have asked for in an agent. “We found Brad out of coincidence in an open house and we quickly realized we wanted him to be our realtor. We cannot say enough about Brad, he was patient, extremely efficient, highly knowledgeable about the ins-and-outs of buying a home, and was incredibly flexible and accommodating in scheduling viewings. He has great expertise in pointing us in the right direction with the entire process, helping set realistic expectations, and basically guided us through every step of going through our first home-buying experience. We felt tremendously grateful for his guidance. He was professional and responded quickly whether by email, phone or text. Also important to us is he was so wonderful to be around that our experience viewing homes was such a sincere pleasure. Moreover, he is highly attentive to detail, so much so that we are thankful to have learned so much from him. Bottom line – I can’t imagine having a more positive experience and recommend him without reservation to anyone looking for an amazing realtor specially in this stressful market. Keeping in Touch Was Very Important and Brad was Amazing!